Microsoft has agreed to acquire Nokia's device business for approximate US$ 7.17 Billion. It is happening amid a market situation where software company Microsoft is having hard time in selling its hardware product Tablet PC; Slate, and Nokia is having hard time regaining its share in mobile phone market. Software system can only show its capabilities by having right hardware and vice-versa. For a software company like Microsoft, all these years Intel and PC makers were its hardware partners. But in the mobile domain, Microsoft did not had any successful partners. After Google acquiring Motorola, Microsoft started venturing into hardware by launching its own Tablet PC. Although Slate failed in the market, it gave Microsoft an experience into building physical products running on its OS. Whether it’s a failure or not, Microsoft is desperate to get into hardware. On the other side, Nokia had software capabilities, SoC chip design capabilities, and hardware manufacturing capabilities, but over the time Nokia failed to make its software called Symbian to compete with Android and Apple's iOS, it has sold its semiconductor chip design business to Renesas. Instead of developing a new mobile software or enhancing Symbian, Nokia decided to use Microsoft's Windows OS (Windows 7 and 8) in its mobile phones. 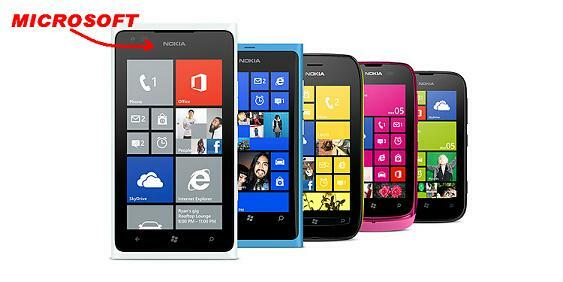 Fairly successful Windows phones from Nokia not able to gain significant share in the smartphone market. In the extremely competitive smartphone market, cost is becoming a decisive factor, particularly in the volume market. Even the high-end phones from Apple are cost-optimised, and there are dozens of low-cost smart phones designed and produced in China. Nokia, which is known for its high-quality phones, not really focused on the cost-factor. A smart phone which is going to be used on an average of three years, need not be very long-lasting and extremely-rugged. So many smartphones designed and produced in China of good quality, (if not as good as Nokia's phones) served the purpose of many middle-class cost-sensitive phone users. Also Google's Android and big-screen touch phones were so well-designed for media watching phone users, they are sold like hotcakes in emerging markets around the world. Apple served the needs of high end customers with highly innovative feature rich phones and the Apple's phones were as tough and long-lasting has Nokia's phones. Mid-range customers were targeted by Samsung and LG and some more such companies. This left Nokia with only some loyal customers who love the brand. Realizing the importance of software, Nokia turned towards Microsoft which was also looking for hardware partner in mobile device space. Both together launched very good phones called Lumia Series. Though somewhat successful, Lumia could not eat into the competitors market share. Nokia had an option to go for Android. For some unknown reason, it still not launched any phone based on Android. Maybe now, if Microsoft had not acquired Nokia, they might had an option to go for Android or develop own software. If any of this had happened, it should have hurt Microsoft. In that sense it looks like, Microsoft has saved a separation (if not divorce) by turning its live-in relationship with Nokia into a marriage by acquiring it. For a big company like Microsoft, Nokia is a very valuable addition provided it does a total renewed look at new products they are going to launch. Tablets are a bigger market opportunity then the smart phones for Microsoft. They can also design consumer electronics systems such as Smart TVs and also wearable electronic devices using Nokia's hardware design talent. As of now the mobile device markets are negative for both companies in mobile devices. But the new combined effort can look into extremely innovative gadgets in multiple domains of electronics. The next horizon in mobile devices is far more attractive than the present one, so the combined strengths of Microsoft and Nokia can target future devices. There is a higher probability of success rather than failure. Any guess by market analysts on Microsoft and Google buying out semiconductor business is also going to be true. In today's vertically integrated business trend, the semiconductor chip design is important block. World's second biggest smart phone vendor, Apple can be rated as world's biggest fables chip designer for internal use. And the world's biggest smartphone vendor Samsung is world's second biggest semiconductor vendor. So over the time Microsoft may have to match its competitor's strength in semicoductor design by acquiring a chip company.